In Greek mythology, Tantalus was the guy who was punished in the underworld by having to stand in water below a fruit tree, all the while feeling terrible hunger and thirst. Yet, when he reached for the fruit or bent down for the water, each would move out of his reach. It's the image of eternal temptation that can never be satiated. Now I kind of know how he felt. Not the eternal part, of course. But I just got back from a trip to SoCal, and we were staying in Anaheim. Not too far from Disneyland, in fact, though we didn't go into the parks. We did, however, spend part of one blazing hot afternoon at Downtown Disney. This happened to be right before the Labor Day Weekend, which happens to be the weekend for a bunch of Disneyland road races. Oh well, it had probably sold out before we finalized our plans. Right???? Why didn't I treat that corn on my foot earlier?!? I recently developed a corn on the outside edge of the bottom of my right foot. It actually took me a while to research (i.e., Google) what it might be that was bothering me, as I was hoping it would just go away by itself. Although it was on the bottom of my foot, I have high enough arches that it wasn't directly pressing down even during running, so pain was minimal unless I went and pressed it. That perfectly described what was bothering me! Further "research" provided me with suggested home remedies. After a couple of days, I went out and bought salicylic acid and corn cushions (donut-shaped adhesive pads that relieve the pressure on the corn). The salicylic acid is supposed to break down the proteins in the dead skin that makes up the corn. The cushion definitely helped at first. The salicylic acid turned the outer layer of the corn a pasty white. I kept up with this treatment for three days. By then, the original corn cushion was getting a bit flat and hence losing some of its effectiveness. This morning, I found a pumice stone and went to work on the corn. After soaking my foot in warm water, I rubbed gently at the corn until an outer layer of dead skin was worn down. I didn't want to irritate my foot, so I stopped there. By dinner time, the improvement was dramatic. Mind you, I had gone for a 7-mile threshold run (5 miles at half marathon pace) in the late morning, so it's not like I had been babying my foot. Yet, I'd say that the corn is about 80% gone already. Why didn't I treat this earlier??? The New York Times has a story about a recent study finding that "people who are good at planning their financial future are more likely to take steps to improve their physical health — and then actually become healthier." I don't find this surprising at all. It seems like replication in another form of the "Stanford marshmallow experiment," where 4-year-old kids were offered a cookie, or donut, or marshmallow, but if they were willing to wait, they would get two of the treats. The kids who waited were later found generally to have better test scores, grades, etc. Yes, I watched most of this season's surprising revival of "Last Comic Standing." (Surprising as in, like "24: Live Another Day," it had been off the air for four seasons before coming back.) I do enjoy stand-up routines though I haven't seen one live in about forever. The finale involved Nikki Carr, an African-American lesbian (I mentioned this because many of her jokes revolved around her race/gender/sexual orientation); Lachlan Patterson, a kind of bland handsome guy; and Rod-Man, best described as if you could imagine Chris Tucker from Rush Hour on speed. Of the three, I would've picked Nikki Carr, but the judges picked Rod-Man. The shame of it is that Machi had to go through WAY more funny material than anyone else did. That's because under the format of the show, the paring of 10 finalists down to 5 consisted of weekly challenges where the contestants would each select someone to face the chopping block by taping an individual confessional that closed with, "I know I'm funnier than ... " Whichever comic got the most votes would then select his or her challenger. Now, under the original format of the show, at least in the early seasons, the face-offs were judged by the actual audience at that location. In the first season, Dat Phan - the eventual winner - kept getting picked by the more professional comics, as all of Phan's material seemed to involve making fun of his parents' heavily Asian-accented English. Yet, different audiences were hearing the same material for the first time, so Phan somehow kept winning. In this season's format, the three judges picked the weekly winners all the way to the end, so Machi couldn't re-use the same jokes. He had to come up with new material. Now, judge Keenan Ivory Wayans did note that Machi seemed to get more comfortable as the weeks went on, which unfortunately worked against his affectation. Perhaps that too contributed to his earlier-than-deserved departure. But I bet the "Jefferson's kids" joke would have had boosted him into the finale, if he could've saved it for then. During my senior year trip to the Grand Canyon, we hiked down and up in a day, which seemed pretty exhausting to us, but I still remember being passed early on the descent by a couple running down the trail. That seemed pretty crazy to me. Now when I see a trail, my first thought tends to be, "Hmm, I wonder how that is for running." Of course, the Grand Canyon is a pretty tough trail: steep and hot. 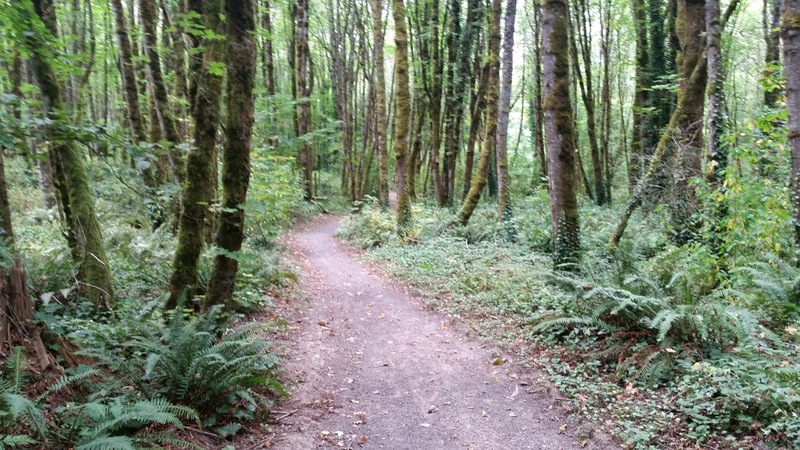 Fortunately, I live in the Pacific Northwest, where most of our trails look like the picture above - verdant forests. Ha ha ha! Even though I don't have the best diet (mostly because my lunches are frequently nutritional disasters), this turns out to be strikingly inaccurate for me. Liquids: I am apparently quite idiosyncratic. I haven't drank coffee since I tried it December 31, 1984; it was so foul-tasting that I've never tried it again. Gatorade is okay, but I almost never buy it. I'm allergic to alcohol so no beer for me. It's pretty much water, milk, juice, and lots of soda. Donuts: I'm immune to the charms of donuts, mostly. Bars: I'll have granola bars occasionally, and I go through phases where I eat dark chocolate, but these don't make up a whole lot of my food intake. Gels: I've heard that salted caramel Gu is to die for, but I'm not big on these either. Ice Cream: Okay, I have my share of this. Fries and stuff that go with fries: Er, remember what I said about my lunches' being nutritional disasters....? Cheesy things shaped like triangles: I'm not big on cheese, except on pizzas. I do have a weakness for potato chips and popcorn chips. As long as the extra hour doesn't require more "Kim Bauer being chased by a mountain lion"-type subplots, this would be awesome! This week's issue of Entertainment Weekly has a feature titled "25 Best TV Spies of All Time." (Unfortunately, no link is available right now.) There are some odd selections, like Johnny Depp's undercover cop from "21 Jump Street," but overall it at least identifies the obvious choices. 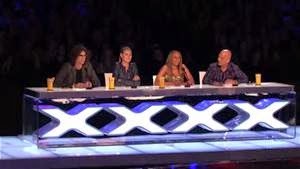 "America's Got Talent" continues to dominate the summer TV ratings, but I've found this year's crop of contestants to be weaker than usual. The best ones are up to the standards of past seasons; there just aren't as many I'd put in that category. Many others are derivative of past acts, without the "wow" factor. Well, he was back for day 9. Will he be back for day 10? 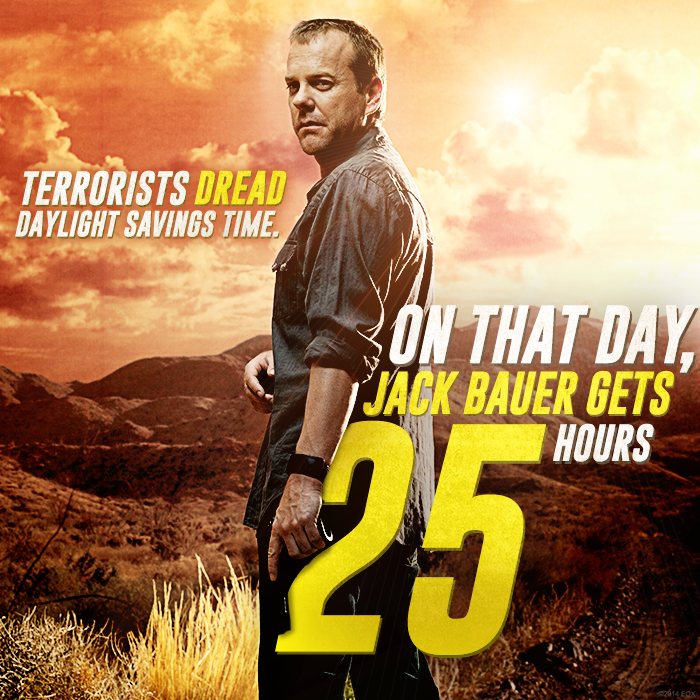 Some tantalizing hints about what day 10 of "24" might look like, if there is a day 10: Jack working for the Russians?!?. The article is actually a couple of weeks old, but I just came across it today. The good thing is that one of the producers, Manny Coto, is out there, floating possible ideas. One of the reasons "Live Another Day" was so good was that it had a tight storyline with plenty of advance planning to weed out filler subplots. I'd love to see "Live Another Day" come back next summer, but if doing it well requires 2016, then I'd rather wait for a better product. If you've been reading my blog at all, it should be no surprise to read that "24" is my favorite TV show of all time. I realize it's not everyone's cup of tea, and my kids know they aren't allowed to watch it until they've turned 16, but I can probably watch it endlessly. I've watched every episode as it aired since mid-way through season 2, and then I re-watched every episode from the first hour of season 1 on DVD, and now I've re-started at the beginning of season 2 (well, actually, the last few hours of episode 1) streaming via Amazon Prime. It's still as addictive as ever for me. I didn't get a chance to go running today, so in the evening, I told my wife that I was "going to see Jack Bauer," which is shorthand for "I'm going to work out." I hopped on my bike in the garage (I've got one of those magnetic bike trainers) and started pedaling as "24" began to stream on my Kindle Fire. 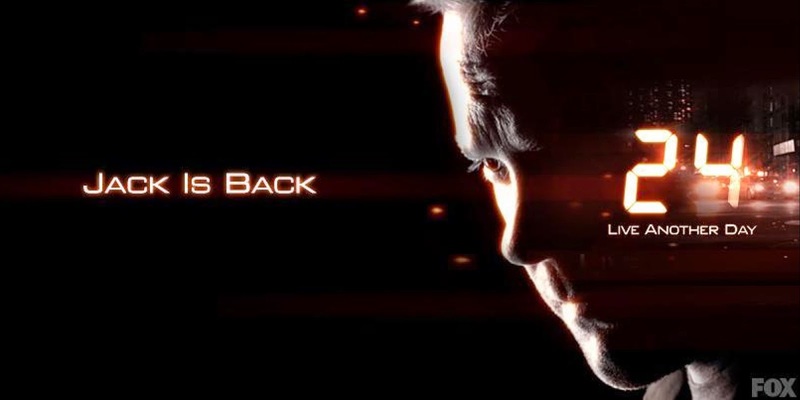 Stripped of commercials, each episode of "24" lasts just under 45 minutes. Cycling isn't as satisfying for me as running is, so 45 minutes is just okay. I'm already in danger of wanting "just a little more" . . . but "24" ends every episode in a cliffhanger! It took great self-control to get off my bike. I could easily see myself losing control and continuing to bike and watch until 2 am. Good thing I don't have an addictive personality. I don't mean to be speed-ist or anything but . . . . The head of the Pennsylvania State Police urged the U.S. Justice Department on Wednesday to withdraw a new lawsuit that claims the agency's physical fitness standards for recruits discriminate against women.